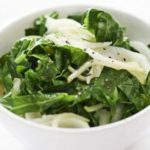 Stir fried collard greens with apple and fennel: Collard greens have a nice sweetness to them that is complimented when stir fried with apple and fennel. Did you know that stir frying is said to have become the preferred method of cooking in parts of Asia owing to the poor supply of wood for fuel. Before this time, oil for cooking was very expensive so most households used the methods of steaming or boiling. Stir frying or ‘chao’ is a technique of cooking ingredients in very hot oil while being stirred. 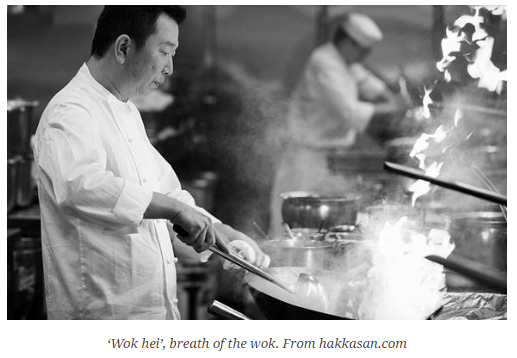 This technique is based on the traditional Chinese and most often Cantonese cooking method using a wok and is known as ‘wok hei‘ which translates as ‘breath of the wok‘. During stir frying the flavours from the metal of the wok itself is imparted into the foods as they are stirred and quickly tossed over a high temperature typically in excess of 200 C (394 F). There are other methods of stir frying. The ‘bao‘ technique involves less stirring and more tossing to avoid the juices of the ingredients being lost to evaporation in the wok. Foods made in this way are more crisp and therefore using the bao method helps retain more nutrients. 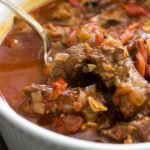 This technique is better for cooking small amounts of ingredients at a time and after each use the wok should be quickly rinsed to avoid leaving residue as you move to the next ingredient. Interestingly, there has been some research on which oils are best used for stir frying to avoid loosing valuable nutrients. For example, the Spanish National Research Counsel stir fried broccoli in various oils and found that stir frying with extra virgin olive oil or sunflower oil helped broccoli retain levels of vitamin C similar to those found in uncooked broccoli. However, stir frying with soybean, peanut or safflower produced significantly lower results. Just something to bare in mind before you dust that wok off! 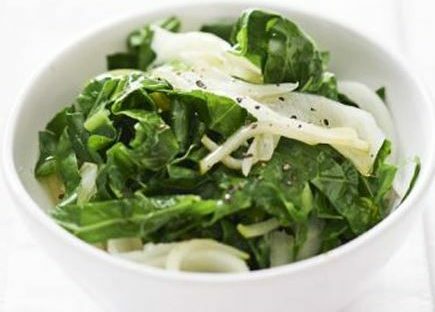 This recipe for stir fried collard greens with apple and fennel comes from the UK’s BBC Good Food network and uses the ‘wok hei’ technique. Heat the oil in a wok or a large pan. Add the spring greens, fennel and apples, season and stir-fry for 2-3 mins to wilt the veg. Add the lemon juice and cook for 1 min more until everything is cooked but still has a nice bite. Sprinkle with the reserved fronds and serve straight away.